On Friday, April 10 2015, a German television crew came to film a segment on Hatsumi Sensei. After training, they did a short interview with Hatsumi Sensei for which I translated. It is always fun to watch interviewers get flustered and a bit bothered by Sensei`s unconventional and seeming simple responses. it was a short interview with brief responses but I found such depth in them and enjoyed them so much, that I thought I would take the liberty of sharing them with all of you here. Because I know must of you don’t have access to German television! I am paraphrasing the conversation, but keeping it as close as possible to the actual responses. It is difficult because when you translate something on the spot, often you forget much afterward. That being said, I think I captured the essence of the responses for you here. I hope you enjoy this short interview as much as I did. All the best, Paul. Interviewer: What did you feel when Takamatsu Sensie made you Soke of the nine schools? Hatsumi Sensei: When Takamatsu Sensei handed over the linages to me and said “Now I leave everything up to you”, I really had no idea. I didn`t know anything. Interviewer: Did something come to fruition because of your training with Takamatsu Sensei? Interviewer: Do people come for the techniques of Budo or the spirituality? Hatsumi Sensei: It can`t be technique because I don’t do technique. It is something beyond technique, transcending technique. Hatsumi Sensei: I would not say that, I don’t think about it, when you stop thinking about it, when your thoughts fall away. maybe something like this. 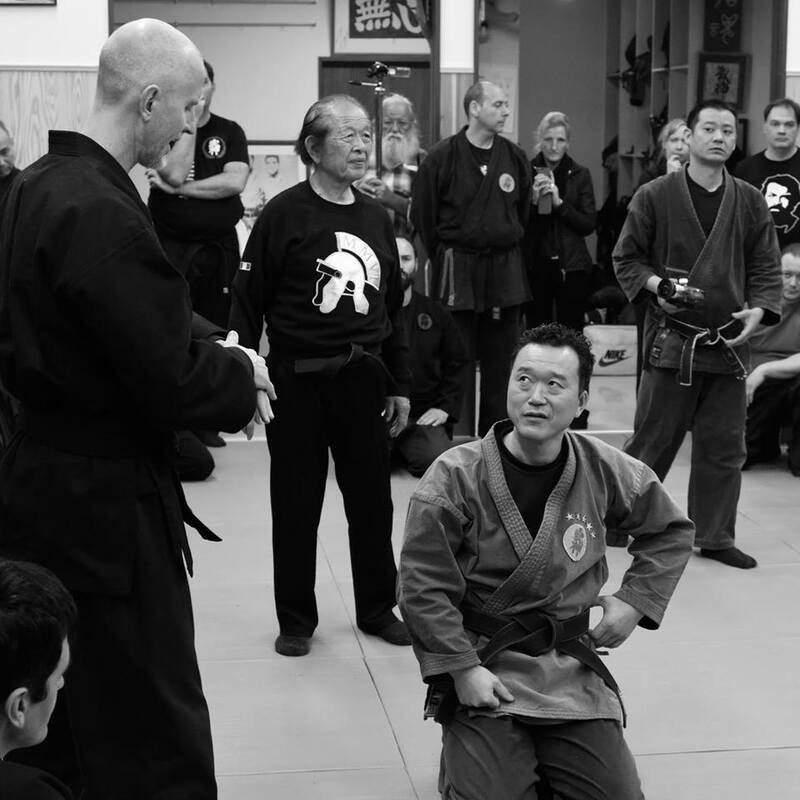 Interview: How do you see the future of the Bujinkan? Hatsumi Sensei; I don’t think about it. You know every day is different. Everyday things are always changing. just like for you too, every day is changing, right? it is like this. Interviewe: Did you receive any results of your training? Hatsumi Sensei: The result is that good people from all over the world come together. People who single mindedly mastered this one thing, they have all come together here. Translating at the Honbu Dojo. A big thank you to Michael Waschak for his fantastic photography. This entry was posted in Sensei Talks on 04/17/2015 by Kasumi An Study Center.